Here’s another parable, about the 1997 move, Titanic. To me, that movie is all about the power of suspending disbelief. You see, there’s one thing that bothered me about the movie. Those divers found a perfectly preserved charcoal drawing – the one that Jack did of Rose in 1912, on board the Titanic. They found that perfectly preserved charcoal drawing after 80 years at the bottom of the ocean. There was a factual basis for the movie. The Titanic did sink in 1912. But a core premise of the whole movie seemed to be that after 80 years at the bottom of the ocean, those divers found a charcoal drawing like the one shown above. (In the ship’s safe, along with the huge necklace shown around Rose’s neck). So even though everything else had turned to mush, that charcoal drawing was “picture perfect” as the night it was drawn. Anyone who knows charcoal drawings knows that even with several coats of fixative – like that shown at right – it won’t last 80 years at the bottom of the Atlantic. For one thing, even if fixative had been invented, the movie never indicated Jack had any, and certainly not in aerosol form. And there was no indication that Jack took the time after finishing the drawing to apply fixative. Thus the question: Since this core premise of the movie seemed patently false – it couldn’t have happened – did that make the whole film without value, not worthy of experiencing? Again, the Titanic did sink in 1912, with great loss of life. And many characters were based on real people who were on the ship when it sank. Still others were composites of several real people. And still others were pure figments of creative imagination. But in the end, the film-writers came up with a story from which many lessons could be learned. That is, someone who saw the movie with an open mind might come away with a sense of hope. That hope might be that there is a world beyond the five senses, a world beyond time and death. Such a viewer might come away thinking love really can transcend everything. He might even think love can transcend time, death, and even the sordid reality of everyday life. But there was that troublesome false premise at the core of the story. The story wasn’t 100% accurate. But again, consider the viewer watching with an open mind. He’d be willing to suspend disbelief and not require the movie to be 100% accurate. In turn that viewer would be treated to a wonderfully intense tale of love overcoming all; logic, time, common sense, even death itself. He’d come away with a good feeling that might help him endure his mundane, boring life for a few days or weeks. He might even be prompted to go out and do something nice for someone else, someone less fortunate. And he might – just might – want to share the movie’s good news. On the other hand, consider the person who viewed the movie with a closed mind. A person unwilling – even for a moment – to suspend disbelief. A person who simply had to believe that everything in the movie had to be 100% accurate. Wouldn’t that viewer just be short-changing himself? The charcoal-drawing image is courtesy of: http://upload.wikimedia.org/wikipedia/en/f/f0/Kate-winslet_titanic_movie_pencil-drawing.jpg. The “fixative” image is courtesy of www.alvinco.com/_R_/Shop/Products.aspx?IID=971. As noted in Utrecht Art Supplies Ask the Expert: Fixative Q&A, “Canned spray fixative was introduced in 1948 by Krylon. Before then, artists relied on the old-fashioned mouth atomizer, which is still available today.” For more on the disagreeable elements of using such a “mouth atomizer,” see Charcoal Fixative – how to fix your drawing – Art Graphica. 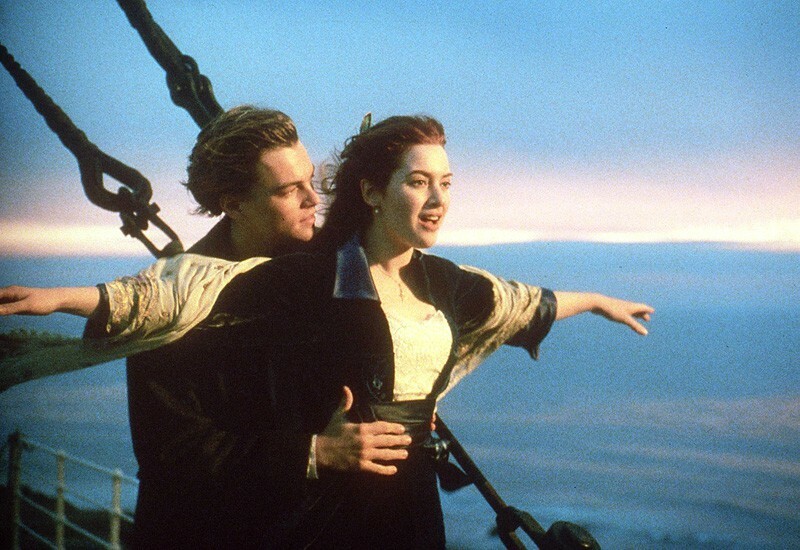 The Jack/Rose image is courtesy of breathedreamgo.com/wp-content…2012/03/titanic-movie.jpg. The Jack-and-Rose picture also raises the question: Does your way of reading the Bible give you a spiritual “set of wings,” or is it more like a spiritual strait-jacket? This entry was posted in Not your daddy's Bible on May 10, 2014 by dorscribe@aol.com.